This is undated, but maybe late ’60s? That is Donna Williams Davis ’73 in the lead. 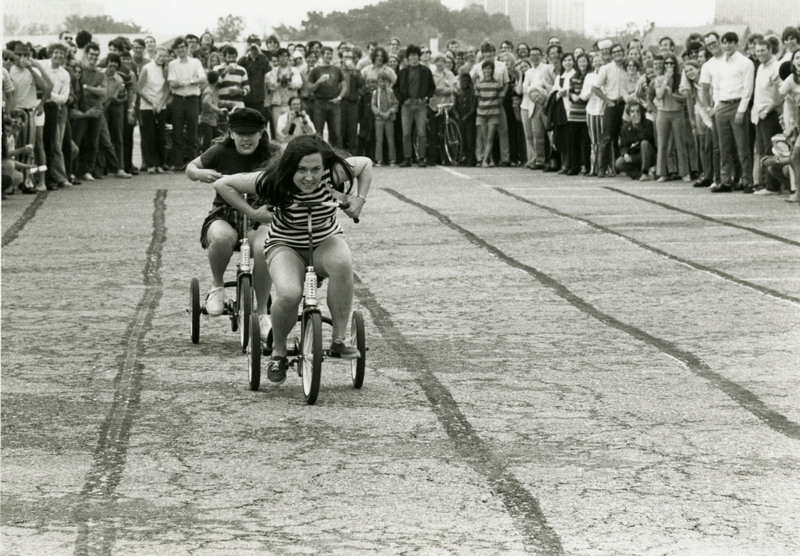 This is probably the ’72 Tea-Trike Race. Now that I think about it, maybe it was taken in ’69 or ’70. I believe it is in one of the Campeniles. Yes. This photo appeared on p. 111 of the 1971 Campanile. It said Kathy Ford was in second place. Ford was in Brown; Williams, Jones. The April 22, 1971, Thresher — the first after the April 17 race — had no mention of results. In 1973, however, the March 29 and April 5 Threshers included a two-part series recounting milestones in the history of Rondelet and Beer-Bike/Tea-Trike. Donna Williams Davis (Jones ’73) just told me she came from behind and blew Kathy Ford off the track. I guess they were the anchor legs of the relay. Anyway, Jones was victorious. Oops – I have an Emily Latella confession here. Donna is not sure she was the last leg of the relay team and she’s not sure if Jones won. I guess the end of the story is lost in time. It’s almost better this way.